Since I was a little child I've had dreams in which I am falling from a very high tree in the forest. Sometimes I would even play the dream in the little forest next to our house. It only consisted of a few very bushy trees and they were the first trees I ever climbed. I was maybe 4. I remember climbing to the top (which was only like 2 m tall but that's quite high for a child) and looking down. Through the bushy needle branches I could see the ground, covered in needles as well. I imagined that the ground was only another row of branches and if I would jump I would break through them and fall even deeper. I jumped with a pounding heart and hit the ground with playful surprise and a shot of adrenaline. 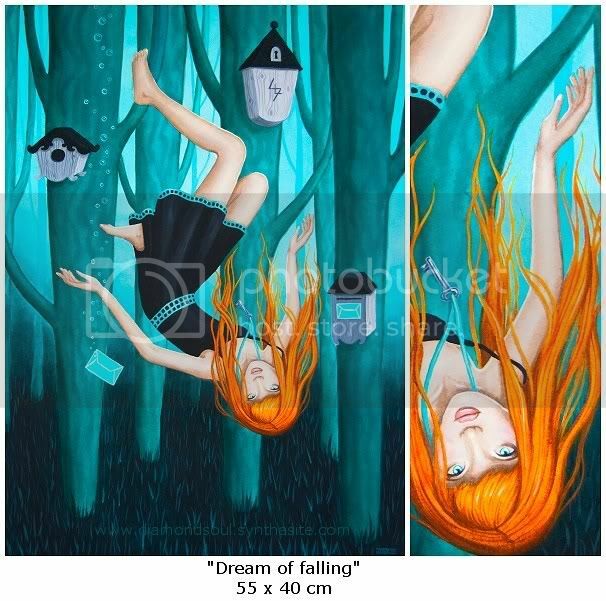 This painting in particular was created after a more recent falling-dream in which I looked out over a blanket of tree tops reaching all the way to my balcony. Because it looked like a meadow I grabbed my chair and little table, climed the balcony fence and walked on it. Shortly after I sat down I crashed through the branches and started a seemingly endless fall along the tall trees.